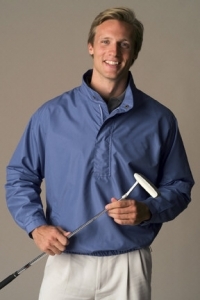 100% sueded microfiber polyester body with water-repellent finish, zip-off half sleeves convert windshirt from long to short sleeves, snap/zip neck stand-up collar, welt front pockets with hidden snap closure, adjustable velcro closure cuffs, elasticized waistband with side zipper for easy access, top-stitching, taffeta lining, generously cut for active wear. Imported. XS-3XL.